Colleagues and friends gather for a photo with Colette Steer after she received a Special Recognition for Staff Award on Thursday, Dec. 7. The 2017 recipients of the Special Recognition for Staff Award pose for a group photo with Principal Daniel Woolf during Thursday's Principal's Holiday Reception. Friends and colleagues from Global Development Studies congratulate Barbra Lalonde Brousseau after she received a Special Recognition for Staff Award. Colleagues from across Queen's University helped celebrate the contributions and accomplishments of this year's Special Recognition for Staff Award recipients during the Principal's Holiday Reception on Thursday, Dec. 7. A wide selection of food and desserts were created by Queen’s Hospitality Services Sodexo for the Principal's Holiday Reception, including the always-popular chocolate fountain. Queen's staff and faculty fill up the main gym of the Athletics and Recreation Centre on Thursday, Dec. 7 for the annual Principal's Holiday Reception. A fabulous gingerbread house, courtesy of Queen’s Hospitality Services Sodexo, was raffled off. This year's winner was Ben Seewald of Advancement Alumni Relations. 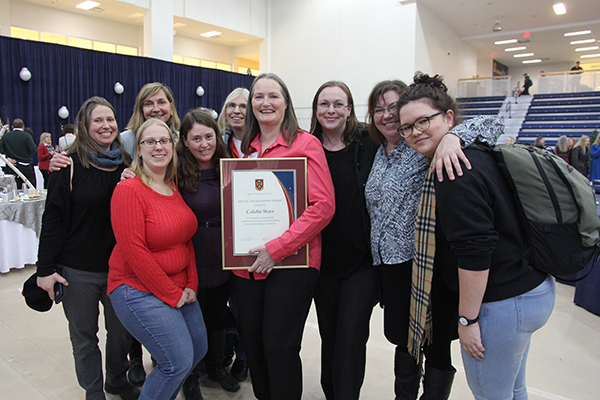 Sandra Turcotte of the School of Rehabilitation Therapy celebrates with her friends and colleagues after receiving a Special Recognition for Staff Award on Thursday, Dec. 7. Family, friends and colleagues gather for photos with this year's recipients of the Special Recognition for Staff Award during Thursday's Principal's Holiday Reception. The contributions of Queen’s staff were recognized on Thursday, Dec. 7 during the annual Principal’s Holiday Reception. Principal Daniel Woolf handed out the Special Recognition for Staff Awards during the event, hosted in the main gym of the Athletics and Recreation Centre. Staff contributed to the community as well as a full bin of food was collected for the AMS Food Bank along with $192.25 in cash donations. The handcrafted gingerbread house, courtesy of Queen’s Hospitality Services Sodexo, was won by Ben Seewald of Advancement Alumni Relations. Barbra Brousseau’s sunny personality belies the focus she employs when tackling the diverse tasks that come her way – or indeed – that she invites her way. Since joining Global Development Studies four years ago, Barbra’s personal investment in the department, its students, faculty and staff, has been transformational. After the department’s graduate assistant retired, Barbra assumed these responsibilities in addition to her own. She introduced a streamlined undergraduate enrolment system that enabled students to enrol themselves, freeing up staff time to assist other students during registration, resulting in a quicker turnaround and reducing students’ stress about getting into a preferred course. On her own initiative, Barbra developed a spreadsheet that allowed the department to calculate future budget scenarios for three years – an accomplishment that won high praise from the faculty office and solidified her reputation as an accounts wizard. Barbara is dedicated to the student cause. Not only does she quickly resolve students’ logistical or program-related questions, she also provides – quite literally – a shoulder to cry on when needed and is a source of endless positive encouragement. With her exceptional organizational skills, discipline, and capacity for hard work, Wendy Cumpson is known as the “go-to” person in her office – always willing to take on new challenges. Last spring, when the department was accepting a flood of new applications for its new graduate programs, Wendy took the lead in processing that flood – on top of her other responsibilities. Wendy demonstrates the highest standards of ethics and responsibility, and takes great pride in her work. She knows the regulations and has every nuance memorized. Graduate students know they can trust the information she provides without question. Wendy knows every single graduate student by name. That makes each one of them – and there are a lot of them – feel important. As the administrator of the School of Policy Studies’ Master of Public Administration and the Professional MPA programs, Fiona Froats is the first person that students turn to with questions about classes, understanding the program or learning about opportunities. Fiona is involved in every step: through recruitment, admissions, orientation, awards, program planning, student study tours and alumni outreach. Fiona makes each student feel comfortable and supported. She provides advice and assurance during what can be the most stressful period of a student’s academic career. She makes sure they are on track and is there to help in any way that she can. Students with offers from other universities have been known to choose Queen’s because Fiona made them feel welcome right from their very first conversation. As a result, Fiona has fostered a strong network of alumni, always willing to contribute and give back to the school, because she was so supportive of them while they were students. Selina Idlas supports educators in their transition to onQ, Queen’s new learning management system, as well providing support for other software connected to the Learning Management System. Thanks to successive software migrations, Selina frequently faces frustrated and less-than-eager users of the new educational technology. Yet, with consistent good humour, professionalism and encouragement, she forges productive and positive working relationships with faculty members, students and staff, while building their confidence and skill levels. The support Selina has provided to more than one thousand, seven hundred and eighty educators through consultations, workshops and collaborative onQ drop-in sessions, makes her an indispensable member of the CTL team and a valuable asset to Queen’s. Pamela Livingston’s attention to detail ensures that the entire biochemistry laboratory teaching program runs like a well-oiled machine. As a senior technician, Pamela provides a nurturing teaching environment for about 150 undergraduate biochemistry and life science students and eight teaching assistants. She is accommodating and willing to adjust her role to make the lab experience as positive and efficient as possible. Her detailed notes and “cheat sheets” help to keep everyone on track. Her approachable nature encourages one and all to reach out without hesitation. Pamela is a huge advocate for her students. If an experiment does not yield the best results possible, she will troubleshoot and adjust the protocol until it meets her high standards. Pamela’s vivacious spirit is renowned. She has been known to wear a tiara on special occasions and hand out gold star stickers for exceptional work. Her exemplary organizational skills make it easy for new staff to join the team and adapt quickly. She literally wants the university to shine and will come in to clean up after hours to prepare the labs for tours and the new school term. Colette Steer is responsible for planning, coordinating and executing the recruitment strategy for 125 graduate programs housed within 50-plus departments. Colette has pioneered new outreach and recruitment methods, attracting a diverse, talented and committed graduate student complement to the university. The Three-Minute Thesis competition, Tri-Council Recognition Event, Graduate Career Week and dissertation-on-the-lake, are now hallmark SGS events, due in large part to Colette’s efforts. Colette responds instantly to all requests and welcomes every visitor like a good friend. A kind and thoughtful colleague, she is always ready with the perfect Aussie-ism to bring a smile. Outside the office, she can be heard on her weekly CFRC radio program Grad Chat, where she interviews students about their research, providing them with valuable media experience and an opportunity to showcase their ideas. Joan Sharpe and Emily Smith came to Queen’s in 2003 to work for the Queen’s Surveillance Studies project. From this beginning, their complementary skill sets would form a framework for success. As the project grew, so did Joan and Emily’s responsibilities. New funding allowed the centre to bring in visitors and visiting scholars from around the world. Joan coordinated these new arrivals, ensuring that their needs were met. More visitors led to more publications. Emily played a critical role in facilitating the production of these publications. When the project applied to become a research centre, the duo took charge of the process, demonstrating that it was deserving of promotion to the next level. Emily and Joan possess a calm, unflappable demeanour and the ability to juggle multiple tasks. Beyond their efficient administration and research skills, they bring energy to every project through their enthusiasm and their ability to relate to staff, faculty, students and visiting researchers. Emily and Joan’s doors are always open for students’ concerns and questions, from administrative procedures and academic tasks to Canadian politics and weekend activities. Since 1999, Sandra Turcotte has been the backbone of the School of Rehabilitation Therapy. Imbued with compassion and a quiet leadership style, she also possesses the confidence to make hard decisions when required. Sandra does not back away from challenges. Instead, she gathers information, consults others and develops the best course of action. Sandra nurtures her staff, ensuring that they have the required skills in a changing workplace through in-house education and continuing development opportunities. She recognizes ability and promise in new employees and mentors them through to positions of greater responsibility. Sandra is fiercely loyal and will go to bat for her work colleagues, family and friends. Her zest for life is infectious and contributes to a happy, positive work environment. Sandra brings the school together. Sandra is content to stay out of the limelight and is happy to see that light shine on others. Today, the limelight belongs to Sandra.